Wait to Start warning indicator for the HMMWV. P/N 12356703-2, 5583395. NSN 5980011868319. OEM part, made in USA. LED illuminates amber with white letters. 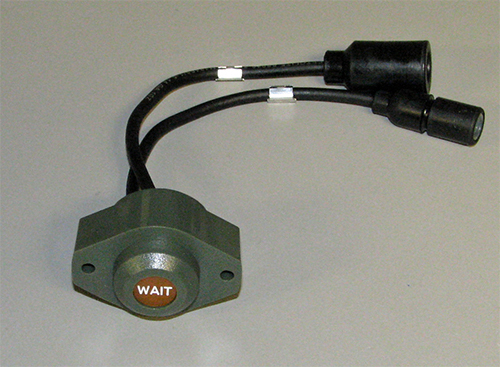 Indicator assembly is sealed from water, dust, and is vibration resistant. Indicator light is an LED and is polarity sensitive. For use with KDS, Nartron, and Prestolite protection control boxes. Wire #571 is (-) / Wire #27 is (+).